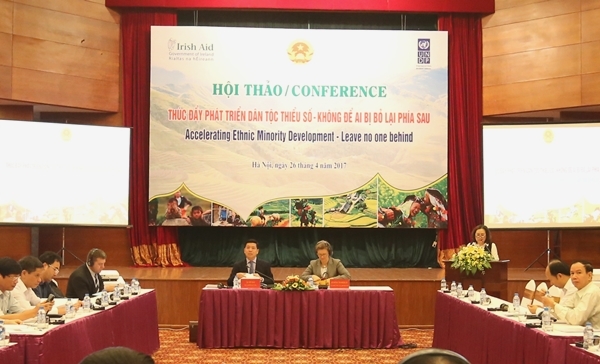 On the morning of April 26th, Hanoi, the Committee for Ethnic Minority Affairs associated with United Nations Development Program (UNDP) in Vietnam launched the “Accelerating the ethnic minority development - no one left behind”. Mr. Le Son Hai – Deputy Minister, Vice Chairman of CEMA and Mrs. Luise Chamberlain - the Director of UNDP hosted the Conference. Attending to the Conference, there are: Mr. Giang A Chu, Vice President of National Assembly’s National Broad; representatives of Ministry of Planning and Investment; Ministry of Education and Training; Ministry of Labour, Invalids and Social Affairs; Ministry of Culture, Sport and Tourism; Ministry of Agriculture and Rural Development; General Statistics Office together with National Broad with provinces in 3 areas and representative of CEMA, Irish Embassy. Under the technic suggest of United Nations Development Program (UNDP) and Irish Aid, CEMA launched the research and analyze and evaluate the socio-economic situation of 53 ethnic minority groups in 2015 through the investigation's result. Through the analytical evaluation, there are two significant issues of ethnic minority groups: education (female illiteracy, go to school at 6 years old) and children morality. Along with that, there are some discoveries of UNDP in 2016 Human Development Report aiming to those who are ignored and actions to abolish these barriers, ensure the sustainable development for everybody. The reports and counsels addressed in the Conference will be the foundation of to help governmental agencies doing ethnic tasks, experts and researchers, cadres to plan a policy towards to fit with ethnic minority people in the next phrase. Addressing at the Conference, Deputy Minister, Vice Chairman – Le Son Hai noted: the chronic poverty and hunger in ethnic minority community living in Northern mountainous area can be seen frequently, there is a big living standards’ gap between Kinh and ethnic minority households living in the same area; ethnic minority households still face disadvantages and barriers in approaching essential productivity resources such as: education, capital, market and agriculture land. These are big challenges in improving ethnic minority households’ living condition and their accessibility to developing economic opportunities and poverty reduction. The Deputy Minister also emphasized: CEMA hopes to have a high approval of entire society, support of international organization in the future to build developing ethnic minority contents, solutions to have a best result from the execution, create fundamental base to execute Sustainably Developing Aim, contributing important socio-economic development to mountainous and ethnic minority communities in the future. Also, Deputy Minister hoped the Conference will be the occasion to call to organization to contributing experience, resource to CEMA build, plan policies which bring the best result for “Accelerating the ethnic minority development - no one left behind”. Mrs. Luise Chamberlain, Director of UNDP sincerely thanked CEMA for co-hosting the Conference. She hoped this will be the chance to solve inequality which is a barrier for Vietnamese development. The questions need to be considered are: Are programs, policies enough? What we need to do to help abandoned groups catch up with the general development? She also specific 3 crucial points need to solve: to have efficient plan, we need to have approachment with other given reports, especially for policy-maker and the public; deeply analyze some datas need to deploy like inequality, child marriage as well as education, job chances, family planning, etc. to see the drawbacks of ethnic minority group, especially women and children and have a solution; raise people’s understand about reason for being left behind: spontaneous or pre-conception to have information and solutions. She comfirmed one more time that UNDP and other developing partners always ready to cooperate in giving new information, data about ethnic minority area as well as support to help Vietnam achieve the goal of sustainable development, no one left behind. The Conference also heard the “2016 Global Human Development Report of United Nations” (UNDP Vietnam) with solutions which take care those who left behind – national policy selection; “The General Report of ethnic minority socio-economic situation” from analyzed result of data from the investigation of ethnic minority socio-economic situation in 2015 (CEMA); Challenges in ethnic minority children healthcare (Minor project PRPP – CEMA). Through the reports in Conference, these are contributing opinions of the representatives to build the most suitable policy.